09.26.10 David J. Eisen, correspondence chess International Master, winner of numerous USCF Absolute Championships and resident of Waterville, Maine passed away on September 16, 2010. We send our heartfelt condolences to David's family and friends. The following obituary was published in the Morning Sentinel and Kennebec Journal newspapers on September 24, 2010. WATERVILLE -- After a life marked by idealism and writing, David J. Eisen passed on Sept. 16, 2010, in Mount Saint Joseph's Nursing Home in Waterville, of complications from cancer. Born in New York City on Sept. 2, 1925, Dave graduated from Horace Mann School in New York before attending the universities of Missouri and Pennsylvania. He married Shirley Cetron in 1946 and remained married to her until her death earlier this year. In 1951, Dave and Shirley moved to Staten Island, N.Y., where their two children, Ken Eisen, of Fairfield and Terry Sinskie, of Dedham, Mass., and Harpswell, were born. They moved to Arlington, Va., in 1961 and subsequently to Falls Church, Va.
Dave began his long involvement with newspapers as a reporter for the Staten Island Advance in 1948, where he worked until 1955 before moving to the Elizabeth (N.J.) Daily Journal, where he remained until 1962, serving as secretary of the North Jersey Newspaper Guild and winning the Newspaper Guild Service Award in 1961. In 1962, he began his 34 years with the American Newspaper Guild. 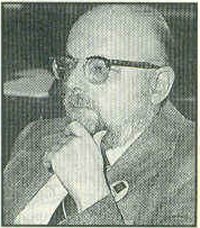 He was initially associate editor, later editor of its newspaper, The Guild Reporter, before becoming the Guild's director of research and information in 1974, a job he held until his retirement in 1995. He also served as secretary of the Federation of Guild Reporters and directed the Guild's Safety and Health program, speaking widely on VDT hazards and giving testimony before Congress and state legislature committees. His keen interest and ability in chess saw him win the U.S. Chess Federation's Absolute Postal Championship in 1980 and 1981 and an International Correspondence Master title in 1998. He was a director of the U.S. Chess Federation, a president of the Arlington Chess Club and a Staten Island chess champion. Always keenly involved in progressive causes, he wrote for many magazines, including The New Republic, and was the treasurer of Washington (D.C.) Labor for Peace and secretary of the Northern Virginia chapter of the Congress of Racial Equality (CORE). Dave moved to Maine in 2005, and lived in Hallowell and then Waterville before his death. He is survived by his son, Ken, of Fairfield; daughter, Terry Sinskie and her husband, Brian, of Dedham and Harpswell and by many nephews, nieces and friends. A memorial service will be held at noon Sunday, Oct. 10, at the Senator Inn, Augusta. Memorial gifts in his name and honor can be sent, at Dave's request, to the American Diabetes Association , P.O. Box 2208, Augusta, ME 04330, or to Greenpeace 702 H St. NW, Suite 300, Washington, DC, 20001, or to MoveOn, https://political.moveon.org/donate/check.html or other progressive or humanitarian organizations. At his request, there will be no visitation hours. Arrangements under the care and direction of Dan & Scott's Cremation & Funeral Service, 445 Waterville Road, Skowhegan.